Hyponatremia is a common electrolyte disorder in hospitalized patients often resulting from elevated arginine vasopressin (AVP) levels. Conivaptan (CNV) is a novel AVP‐receptor antagonist that produces aquaresis, the solute‐free, electrolyte‐sparing excretion of water, by ing AVP V2 receptors. The efficacy and safety of using CNV in the treatment of euvolemic and hypervolemic hyponatremia of various causes were investigated in a 4‐day, multicenter, open‐label study. The results for a subset of patients with severe hyponatremia, defined as serum sodium concentration ([Na+]) < 120 mEq/L are reported. Patients received a CNV 20‐mg intravenous loading dose, followed by a continuous 4‐day infusion of CNV 20 or 40 mg/day. The primary efficacy measure was area under the serum [Na+] time curve (AUC) from baseline to end of treatment. Secondary efficacy measures were also evaluated (see table). Of the 251 patients given treatment, 28 had a baseline serum [Na+] < 120 mEq/L. Baseline serum [Na+] was similar in both treatment groups (see table). Both CNV doses increased serum [Na+] AUC and absolute serum [Na+] from baseline. Other secondary efficacy measures also showed improvement. A serum [Na+] correction was demonstrated on follow‐up day 34, with final mean serum [Na+] of 133.8 and 132.8 mEq/L in the 20 and 40 mg/day groups, respectively. CNV was well tolerated; infusion‐site phlebitis, hypokalemia, infusion‐site reaction, and hypotension were the most common adverse events. One patient in each group discontinued treatment because of an adverse event. Although 5 patients with severe hyponatremia experienced an overly rapid rise in serum [Na+], no patient had permanent neurological sequelae, such as osmotic demyelina‐tion syndrome. 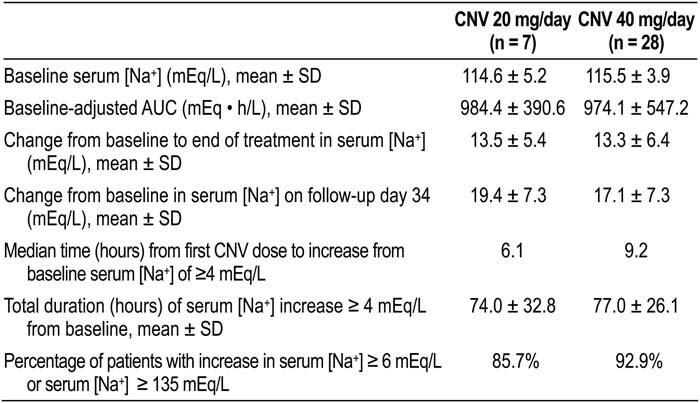 CNV 20 and 40 mg/day increased serum [Na+] in patients with severe hyponatremia. S. Rosansky, None; L. E. Wagoner, None; J. G. Verbalis, Astellas Pharma US, Inc., consulting fees or other remuneration (payment); Otsuka Pharmaceutical Co., Ltd., consulting fees or other remuneration (payment); sanofi‐aventis, consulting fees or other remuneration (payment); B. McNutt, Astellas Pharma US, Inc., employment (full‐ or part‐time); N. Smith, Astellas Pharma US, Inc., employment (full‐ or part‐time); B. Yan, Astellas Pharma US, Inc., employment (full‐ or part‐time). Rosansky S, Wagoner L, Verbalis J, McNutt B, Smith N, Yan B. Conivaptan for the Treatment of Severe Hyponatremia: Open‐Label Study Results. Abstract published at Hospital Medicine 2007, May 23-25, Dallas, Texas Abstract 52. Journal of Hospital Medicine. 2007; 2 (suppl 2). https://www.shmabstracts.com/abstract/conivaptan-for-the-treatment-of-severe-hyponatremia-openlabel-study-results/. Accessed April 25, 2019.